• A degree or diploma in Civil Engineering, Computer Science/Information Technology, Electrical Engineering/Electrical & Electronics Engineering, Electronics & Communication Engineering, Industrial Engineering, Mechanical/ Production Engineering, Metallurgical Engineering/Foundry Forge Technology from a recognized university. • Non-engineering graduate degree in Secretarial Practice & Accounts/Office Management & Secretarial Practice from a recognized university. • Got degree or diploma on or after the year 2016. • Haven’t undergone training/ work experience of more than one year. • The ward of HEC employees/ex-employees/contract labour/ hatia displaced and of deceased employees will get 10% additional weightage in their score. • The age of the candidate should lie in between 18 years and 30 years as on 30/11/2018. • The SC/ST/ OBC candidates will get relaxation according to the reservation policy of the Apprenticeship Act 1961 and Rules 1992. 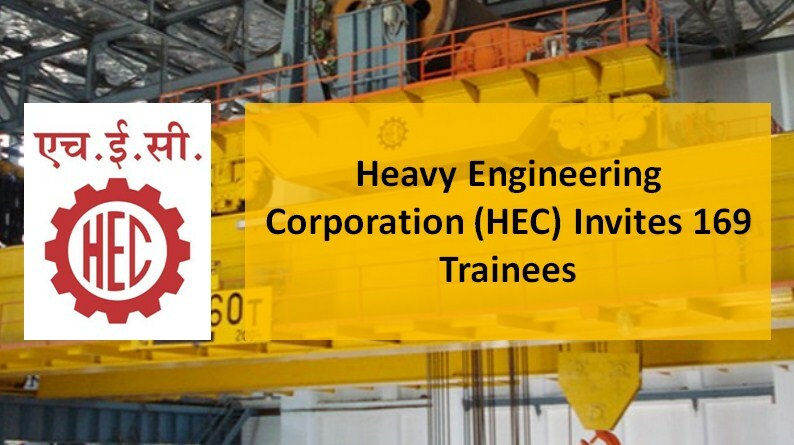 • Register with http://hecltd.com/jobs-at-hec.php between 10.00 Hrs of 27/11/2018 and 17.00 Hrs of 10/12/2018. Sign with your email ID and mobile number. • Upload scanned copy of the recent coloured passport size photograph with white background and a scanned signature in JPEG/JPG of the candidate. • If paying online, save a unique Payment Reference Number at the time of online application and a link for making payment. Take a print out of the payment slip. • Submit the details of SBI Collect Reference Number (10-digit alphanumeric reference number with DUxxxxxxxx) and date of deposit. You can find it on the e-receipt. • All correspondences in future shall be made on the registered email and mobile number. SO, keep them active for at least one year. 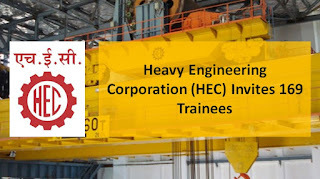 • Demand Draft of INR 1000/- in favour of Heavy Engineering Corporation Limited payable at RANCHI of a Nationalized Bank as medical examination fees. • Pay online through internet banking/Debit Card (Visa or Masters)/ Credit Card (Visa or Masters)/ Bank Challan. • If you want to pay later on, click the link stating “Acknowledgement-For Registered Candidates Only”. • The payment is non-refundable under any circumstances.